Watching CSI drama series and reading serial killer books, I always look at their story as a 3rd party, blaming the victim for believing strangers. But I never put myself in the story. Opsss….nothing happen to me, Alhamdulillah. But maybe next time I should think more and always remind myself that I might be the victim. Travelling solo in South Korea, I always grateful that till now I was blessed to meet nice and good people. Maybe because I become familiar with South Korea or I never meet bad people there, i tend to feel safe and comfortable travelling alone or asked people for help. But one accident, for a moment gives me a doubt or at least installed a reminder to me that I should be more cautious in believing stranger. It was an early morning when I left Jinju city to Hapcheon, neighbouring town. 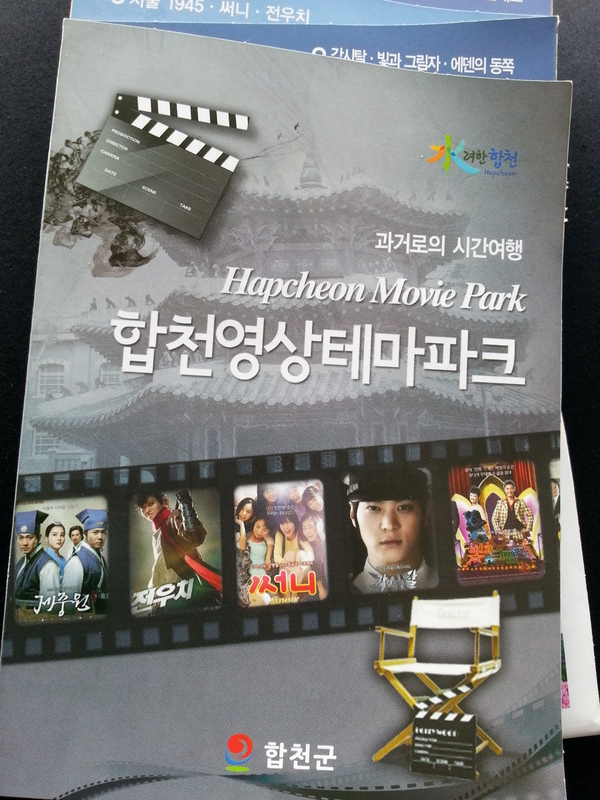 I took a bus cost me around 7,000 won and travelled almost an hour with mostly elderly peoples to Hapcheon with my one an only place in mind, Hapcheon Image Theme Park. This theme park is the largest drama & movie set in Korea where famous drama and movie such as Into the Fire, East of Eden, Gaksital and many more used to be filmed here. From the Hapcheon bus station, I took a taxi to the theme park that cost me around 15,000 won (expensive!!!) and almost 20 minutes rides. Hapcheon is a small town, sleepy and quite. So, I’m not surprised that other tourist recommended taking taxi instead of bus coz you will never know when you can get one. Arrived after a long chat with the taxi driver, paid the entrance fee for 3,000 won if I’m not mistaken i found myself hesitating either to go right or left to start the tour. And I heard a guy voice advising me to go left first in English. I turned around and a Korean guy wearing tracksuit with sleepy face smiling at me and not long after that we somehow ended up touring the whole theme park together. Having watched some of the dramas and movies filming here, I quickly matched up the drama and movie scene with the building, road, view at the theme park while touring. “Oh, this is where Gaksital saved his girlfriend, this is where Gaksital jumped from the bridge and fight” . My new tour buddy will add some info from the movie and drama that I didn’t watched and 1 hour passed by without we realized. “I don’t know how you come to know this place and have an idea to come here coz even myself, I wouldn’t be here if I don’t have some business to do in Hapcheon” my tour buddy keep repeating that to me. “ Man, I wouldn’t be here if this place not open and been promoting in your tourism website” But I just smile instead of answering like that coz I understand for locals they can’t imagine why a tourist would like to go to a place that locals find it nothing. Walking out from the theme park, I started figuring out on how I can return back to the bus station. 1. I have to go to the ticket counter and asked the staff to call a taxi but another 15,000 won …emhhhhh 2. Cross the street and wait for a bus and waiting and waiting in the cold winter. And I just say yes for the 3rd option offered by my tour buddy who is willing to send me to the bus station by his car. Upon entering his car and the car start moving, I can’t help asking myself If …if my tour buddy happen to be a serial killer, a psycho, a thief, a bad guy. If anything happen to me, I don’t think I can get any help. I was regretted choosing this option without a long thought. OMG, please help me …. Please..Please ….let my tour buddy be a normal person, a kind person who just want to help a friend. Panic button was hit!!! My Tour Buddy “What are you planning to do after this? I think I want to grab a lunch before I leave to Seoul”. While waiting for a bus back to Jinju, I keep thanking God for sending another good guy to me. But thinking that possibilities he can be the opposite freaking me out. And I prayed hard that in the future too, God will send me only good people along my way. Soon, riding the bus full with elderly people and watching the driver who without any complain and will stop whenever the elder asked him to stop without ringing the bell or at designated bus stand, I smiled …. Somehow this world still has good human being. ← Jeonju ….. Hol….Why didn’t I come here earlier? hai. interesting story. tak pernah terfikir nak pergi tempat yang jarang orang pergi. You go there alone or with friends?